We have come to the part of the Mt. Fuji hike that was a bit unpleasant. There aren't too many pictures at this stage for a couple of reasons. First of all we were walking in the dead of night, making most shots useless. No one among us had the interest or energy to whip out their camera anyway. Surely the look on my face at this point wouldn't be one that should be remembered. I'm not going to elaborate too much on the difficulty of the hike, mostly because I don't want to risk sounding like a big whiner. Hehe. A new little wrinkle was beginning to show itself. 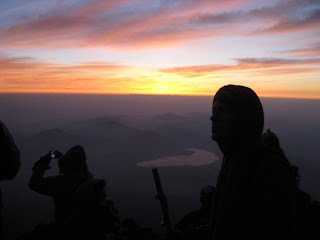 I began to feel the effects of the altitude. 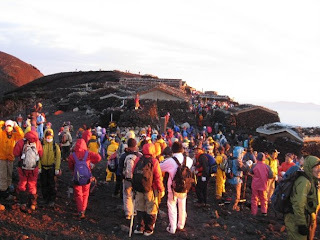 At first I noticed that I needed to take deeper breaths more frequently, but by the time we reached the top (Fuji is 3,776 meters tall) I needed to take breaks as if I was running up the mountain. At the little rest stations I noticed more and more people taking whiffs of their little oxygen cans. Luckily the air never made me that uncomfortable, just out of breath. I hear that altitude sickness can be quite painful. We arrived at the top around 2:00 in the morning. The wind and the cold were still quite a problem. We huddled together on the side of a building and waited for day break. Maybe an hour and a half later a little cafe sort of thing opened up. Of course every single person on the mountain wanted to be in that tiny warm space at the same time. We managed to squeeze in but had no place to sit down. I finished a nice hot miso soup while I watched the sky lighten. Rarely do I ever watch the sun at work, but today I was witnessing a sky being painted. Sunrise was at 4:20 that day. Striking a pose. The little shape down there is Lake Yamanaka I believe. My mountain climbing comrades enjoying the sun. 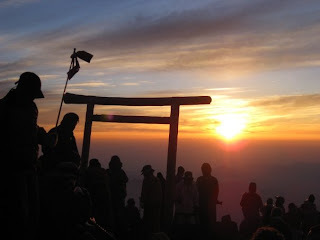 A tori gate on Fuji. I hear it is pretty famous. A mass of people on the top. I think that this is the most colorful that I have ever seen people in this country dress. Here is a shot of the crater of the volcano. You can just make out the meteorological station on the other side. That's actually the highest point on the mountain, but it didn't much look like it was worth a visit. After the excitement had ebbed and the sun was fully up, an inconvenient truth remained. We were on the top of a mountain. Now we had to get down. I was very tempted to think that the journey downwards would be easy. Heck, I'd been fighting with gravity so long, I figured it might be nice to have it on my side for a change. Well, it wasn't exactly that simple. For one thing, the downward track is completely separate from the way up. This new path down was a very long and boring one. The trail zigged and zagged in a series of switchbacks that went as far as I could see. The rock was a loose, red gravel. Trudging at a downward angle for so long had my feet hurting a lot. My toes slammed into the front of my tennis shoes with every step. The Mars landscape of Mt. Fuji. If you give this picture a click, you can see the brightly colored people still trying to get to the top. There are so many of them that they are pretty much standing in line on the side of a mountain. You see, many people rented a little space to sleep on at the various rest stations we passed. Then they woke up and all tried to get to the top at the same time. I didn't feel much pity for them... they tried to go the easy way and got burned. An interesting sign. Mt. Fuji sits on the boundary between Shizuoka and Yamanashi prefectures. It was pretty important for us to make the right choice here, or we would have had a much longer day. A nice view part of the way back down. Once on the ground, our journey back to Ashikaga probably would have been amusing to behold. Four awful looking souls trudging through busy Tokyo train stations. I was dirty, sore, and smelled awful. By the time I got back to my apartment I had been awake for way more than 24 hours. People knew what was up though. They knew that we weren't just a group of foreign homeless people. We all had our walking sticks, mine with the bell still ringing with every step. One random person in a station even asked me about it. I got a "wow" after I confirmed her suspicions about where I had just been. It felt pretty cool. My walking stick, featuring all the little wood burnings I acquired. It has a million nicks and scratches on it, and the bottom is worn round. Best souvenir I can remember having. Only in Japan. Selling small bottles of oxygen. Amazing.